By far the #1 first modification for your Mustang is a custom Brenspeed tuned X4. Our custom tunes will give you the fastest throttle response possible, increased HP, the maximum torque possible at lower RPM’s, and often improved MPG. Brenspeed’s custom tunes are a far cry from your basic aftermarket tune. We have years of experience and R&D invested into our tunes to give you more benefits than just a peak HP gain on the dyno. With multiple modifications performed to many parameters within the torque management, adaptive learning, and drive by wire tables it is common to reduce quarter mile ET’s by as much as a half second. The Brenspeed Custom Tuned X4 includes one custom naturally aspirated tune (not nitrous/turbo/supercharger) developed for your Mustang and then that tune modified for 3 various octane fuels. This way you can run regular unleaded fuel if you desire or to take full advantage of your package by running premium fuel. 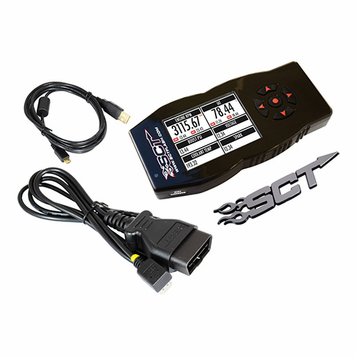 The SCT X4 will store the factory tune so you can return the vehicle to stock at any time. UPGRADES! Before you read on keep in mind we offer a couple upgrades using the drop down boxes above. First is our expedite option which we explain in more detail below. Second is a great mod to do to your Mustang after our tune, Steeda Underdrive pulleys! They will add 10+ HP to your Mustang and work great in combination with our custom Brenspeed tune. They can also be added above using the drop down at a deep discount over normal retail price. Our sales department will e-mail you to find out about your current modifications on your Mustang, and other information so we can develop your custom tunes. 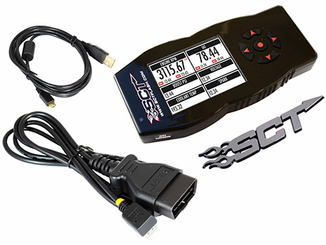 The custom tunes will then be loaded on your SCT X4 so all you will have to do when it arrives is plug it in and allow the custom tunes to load on your Mustangs PCM. It is that easy!